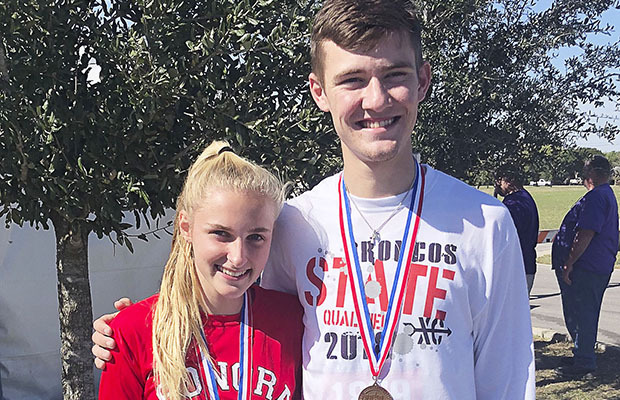 Evan Shannon and Camille Harris finished both were awarded medals Saturday, November 3, 2018, at the UIL State Cross Country Championships in Round Rock. Shannon finished fifth and Harris fourth in the state meet. Coach Jessica Barnett said both athletes were well prepared for the contest. The goal for both Shannon and Harris was to run their best time all season and collect a medal. “That is just what both of these hard working athletes did,” Barnett said following the meet. Shannon, a senior, ran his personal best with 16 minutes, 8.69 seconds over the 5,000 meter course to finish in the Class 3A boys top 10. Shannon finished in fifth place. This was his first and only time to compete at the state cross country event. Shannon out paced all four of the runners who placed ahead of him at the Regional I-3A meet in Lubbock October 22. Harris, a senior, also improved her time by 20 seconds to earn fourth place in the Class 3A girls cross country. Harris also earned fourth place last year at state for Class 1A. Harris finished with a time of 12:00.65 running the 3,200 meter course in Round Rock. This is Harris’ fourth State Cross Country appearance.